Those who have read this column a few times know that I'm a sucker for a unique premise and/or unique handling of a time-honored horror plot. Not that doing the same old thing in the same old way can't be made exciting and enjoyable, but it's nice to see horror filmmakers try and push the boundaries of the genre. And while different-for-different's sake isn't appealing at all, a rarely- or never-seen concept executed in a capable fashion is almost akin to discovering buried treasure; it's a thrill beyond measure. Enter Fallen, which at the time of its release in 1998 had what was actually a fairly new concept. Dedicated detective John Hobbs, the lead investigator credited with the capture of Edgar Reese, a particularly vicious serial killer, witnesses Reese's execution, partly to reassure himself that the nightmare which was the case is, in fact, over. But soon after the killer's death, the murders begin again. At first it seems a copycat may be on the loose, but the police holdbacks, signature aspects of the original murders that only the killer would have known, are present in these killings as well. Was the wrong man put to death? Or is there something else, something perhaps more sinister, occurring? One of the interesting things about Fallen is that it is, in a way, told in flashback. The film begins with the always-excellent Denzel Washington, who plays Hobbs, telling us in voiceover essentially what we're going to be seeing. He also informs us that he survives, which is not quite the spoiler one would think on the face of it. In fact throughout the film, as we watch Hobbs' dawning realization that maybe Reese wasn't as crazy as some of his rants might lead one to think, what we see and hear isn't ever quite what we believe it to be. And as Hobbs' colleagues and superiors begin to fear for the detective's sanity, and the audience begins to fear for Hobbs' life and soul, the film always chooses the road less traveled. It lays out the truth before us, but it is subtle and not quite in focus, and it isn't until the final frame, in a scene guaranteed to give even the most seasoned spook-movie viewer goose bumps, that we come to realize exactly what Denzel was telling us at the top of the film. The cast is top-drawer here; in fact, it's the type of A-list cast that horror films rarely see. 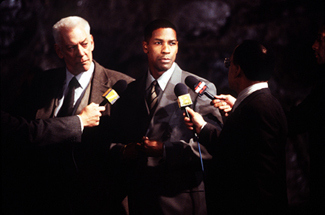 In addition to Denzel, there's John Goodman as his partner, worried about his friend but not entirely sure Hobbs isn't onto something and demonstrating, once again, that no, it wasn't only Roseanne Barr who made that show work; Donald Sutherland as Denzel's superior, who doesn't want to lose the political currency he gained when Reese was brought to justice and who isn't above sacrificing a subordinate in order to protect himself; and Elias Koteas as the maybe-not-as-dead-as-everyone-thought Edgar Reese. The supporting players are excellent as well, and the taut script features intelligent dialogue and enough twists and turns to keep the viewer from figuring out exactly what the deal is before the filmmaker is ready to reveal all. The flick runs just over two hours, but it is so engrossing, so well filmed and even better acted, that you'll never notice the time pass. But above all, it is Denzel Washington who carries the film, turning in a nuanced performance that grabs the viewer's attention and carries it all the way to the ending. It's rare to find a horror film that is not only based on a unique concept, but is well-written, well-acted, and provides such a witty twist at its end all in one package. Fallen rarely makes it to cable these days, but you can find it at your local video rental emporium, and it's one I highly recommend you place on your wish list. I'd even suggest you bump it up near the top, because quality filmmaking like this deserves acknowledgement, and what better way to reward those who put this together than by viewing it? Especially when there's such a glorious gift for the viewer supporting better product.